A good board-staff relationship is key to a thriving ministry. In this follow-up to the popular Serving as a Board Member book and DVD, John Pellowe walks through the keys to a healthy relationship between boards and their senior leaders. You'll learn practical ways to support both roles, resolve conflict, conduct leadership reviews, and end the relationship well. 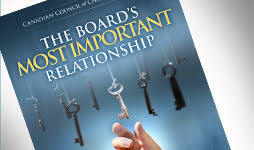 Featuring discussion guides and fresh perspectives from six governance consultants and practitioners, this book adds new topics and insights to The Board's Most Important Relationship DVD. While the DVD was designed for group training in segments of 15-30 minutes, the book is designed to provide each director with a more in-depth discussion of the issues. The book and DVD together make a comprehensive board development resource to help directors and senior leaders forge a great working relationship for the sake of their ministry and the cause of Christ. 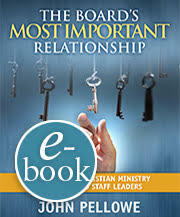 The Board’s Most Important Relationship will be available in all major e-book formats. When you purchase an e-book you will receive a link in your email receipt to download your choice of e-book file.